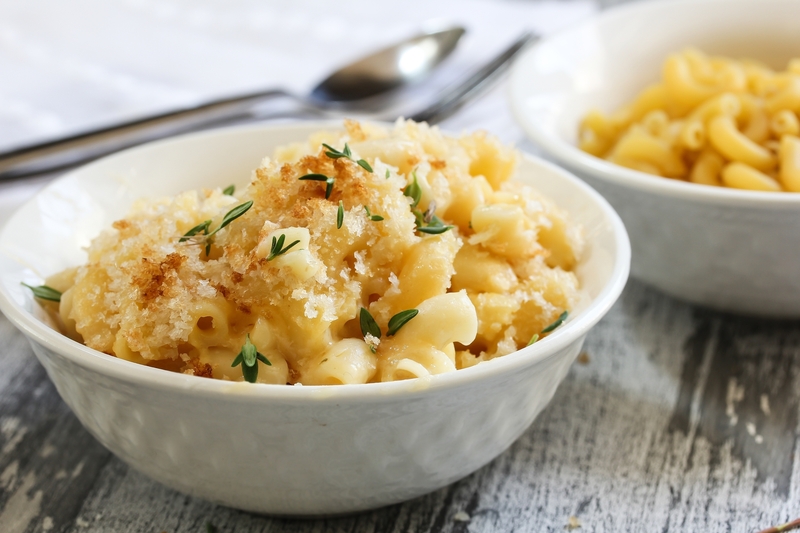 There's never a reason to not have mac and cheese, especially when it's topped with breadcrumbs made from Milio's fresh baked bread. 1. Preheat oven to 400°. In a stockpot or Dutch oven, cook pasta according to package directions for al dente; drain and return to pan. 2. In a food processor, pulse bread, 2 tablespoons butter, Parmesan, 1/2 teaspoon salt and 1/2 teaspoon pepper until coarsely ground. Set aside. 3. Meanwhile, in a large skillet over medium heat, melt remaining butter. Add onions and cook until tender, about 3 minutes. Add ground mustard and cayenne pepper; stir until blended. Stir in flour until smooth, about 3 minutes. 4. Slowly whisk in milk and cream; bring to a boil. Reduce heat to medium-low; simmer, stirring constantly, until thickened, about 5 minutes. 5. Remove from heat; stir in cubed cheese. Slowly add remaining cheeses a handful at a time, stirring until cheese is melted. Add Worcestershire and remaining salt and pepper. Pour over pasta; toss to coat. 6. Transfer to a greased 13×9-in baking dish. Sprinkle breadcrumbs over top of casserole. Bake until topping is golden brown and sauce is bubbly, 10-12 minutes.